The VICTORY GARDEN CHALET has 9.3 m² (101 ft²) of floor space and the high vaulted ceilings allow plenty of room for trellising your tall growing plants or climbing vines. 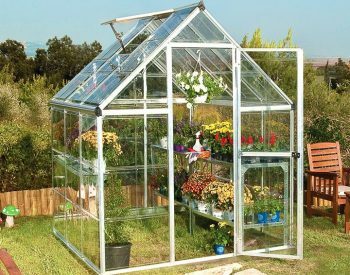 Two adjustable roof vents and wide hinged double swinging doors provide ample ventilation to control heat and humidity levels. The doors are equipped with a magnetic catch and low threshold for easy access with wheelbarrow or wheelchair. 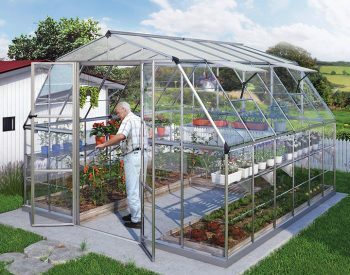 This versatile greenhouse also features a powder coated charcoal grey Aluminum frame and a galvanised steel base for added structural support, stability and alignment. 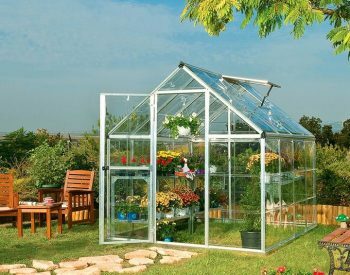 The SILVER LINE VICTORY GARDEN CHALET can be used as either a greenhouse or a garden living area – or both! 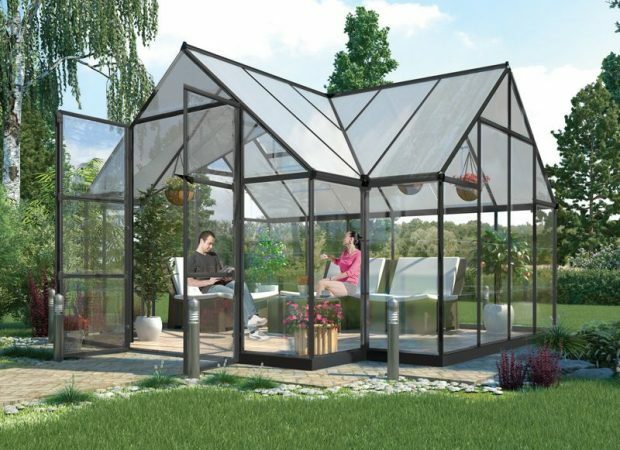 The T-shaped cathedral design offers the ideal combination of outdoor leisure room or conservatory and gardening space; a place to relax out of the wind and rain at a price which is only a fraction of the cost of a custom built greenhouse of the same size. 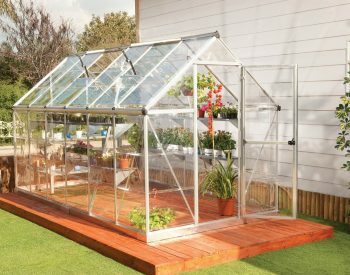 The VICTORY GARDEN CHALET is framed with a robust aluminium extrusion system strong enough to carry heavy snow loads, and the walls glazed with clear polycarbonate panels. 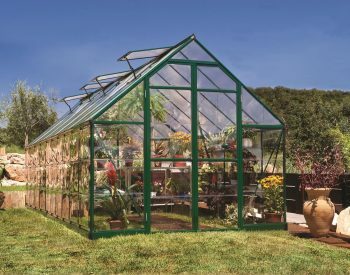 Supplied as a kit designed for easy assembly with comprehensive step-by-step instructions, the VICTORY features the sliding panel installation system utilised by the Palram greenhouses range.